False Rue Anemone floral pollen attracts small bees and flies but it has no nectar! Planning for a pollinator friendly garden is not complicated, but there are a few must dos to make your ecosystem a healthy place for all the critters that visit and live there. *Choose plants that make sense for your garden. Local pollinators have evolved with native plant species and are more likely to be attracted to native plants, you can check with your state native plant society or wildlife garden guides for planting ideas. Yo can also check out the pollinator guides that the Xercis Society has put together. *Plant large swathes of nectar and pollen producing plants. Plant at least three of each plant~Many bees practice flower constancy, working one flower type at a time, so give them a lot of each kind plant and a lot of different plants. *Plant host plants~don't stop at nectar and pollen plants. The Monarch butterfly is a great example of a pollinator that needs a specific plant, in this case milkweeds, in order to reproduce and live in your garden. There are many others that a plant specific~like my dear Susans/Rudbeckia hirta,~they're a larval host plant for the Silvery Checkerspot butterfly. *Avoid hybrid strains with 'doubled' flowers, they often lack pollen, fragrance and nectar as a result of the hybridization. A good way to check a flower out before you bring it home is to observe it for any pollinator visitors while shopping at the nursery. I stay away from pretty flowers that have no visitors and stock up on those that are pollinator hotels! *Plan for bloom from late spring to early winter. Since bees are most active from February to November (longer in mild climates) late winter blooming Hamamelis vernalis and the earliest spring ephemerals (like the toothworts, hepaticas, spring beauties, and False rue-anemeone seen in this post) are perfect plants for a variety of pollinators when gardens are too cold for other perennials. I've even noticed honeybees are visiting the crocus on warm sunny days. *Bee sure to include water. Shallow birdbaths, mud puddles or even just a small saucer with sand and rocks helps supply pollinators with the necessary water and minerals they need when ever they are out and about, but especially in the long, hot, dry summers. *Provide nesting sites for a variety of visitors. Leave a three foot square of bare soil for ground nesting bees and ix-nay on the plastic landscape cloth~bees cannot tunnel through it. Leave decaying logs for beetles and tunneling bees. Build or purchase specialized bee houses...trust me.building your own Pollinator Condominium is a fun project! *Never, ever, ever, ever, ever use pesticides! You know, I really do mean NEVER! 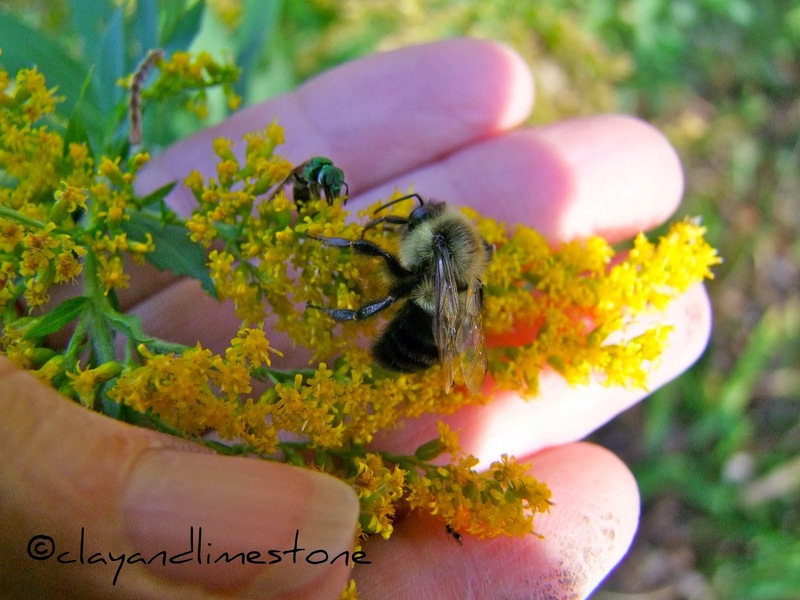 Your pollinators will thank you! Now, go have fun planning your garden. I am waiting for the first pollinators of the season. I guess the snow will have to leave first. 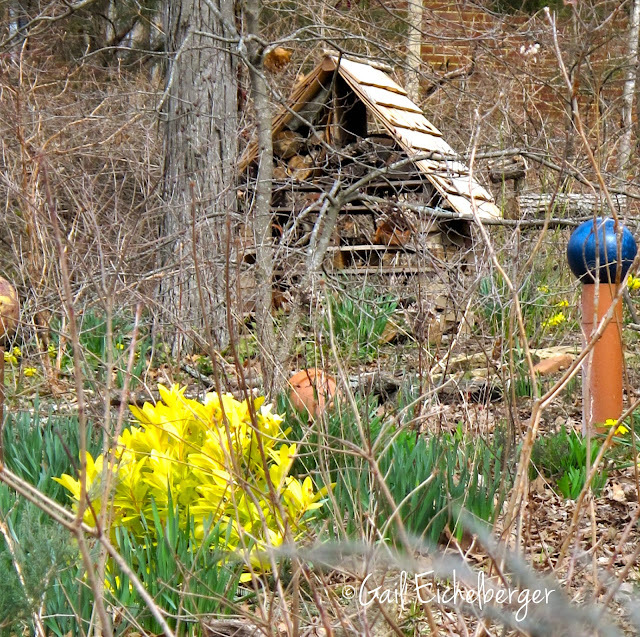 Love your long shot of the daffodils and your new pollinator condo. Great job! Ditto what Layanee said. There are some type of fly that hovers over the snow, but I haven't even seen them yet! Well said, Gail and as always, beautifully illustrated! We have seen many bees on the hellebores and crocus on warmer days, which have been way too rare this year. I like what you say about the swath plantings. I have noticed there are way more pollinators on the larger plantings of one flower, going from bloom to bloom. When those grape hyacinths bloom, soon!, it will be bee heaven here. Good reminders for me...I appreciate these posts so much. Thanks! Thanks for a great post. I haven't seen any pollinators yet this year, but I know that soon we will be covered up as usual!!! I have several clumps of orange Butterfly Weed for the butterflies, and this year I bought more seeds in different colors. I totally agree....NO pesticides!!! Today I completed trimming all of last year's growth on my perennials. I never realize how much I have until I start trimming....it took me about 5 days total to complete! So happy it's done! Always good advice! You are a champion for the pollinators! Every time I see a pollinator I don't recognize, I wish you were here with me to identify it! An excellent guide to helping pollinators. I usually prefer the look of the straight species or single-flowered varieties, even if they weren't for pollinators. 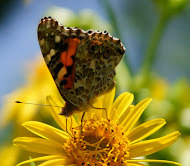 Did not know about Rudbeckia being a host for checkerspots butterflies. Looking at the photos of your wildflowers is like seeing the faces of old friends from my past....I miss them. 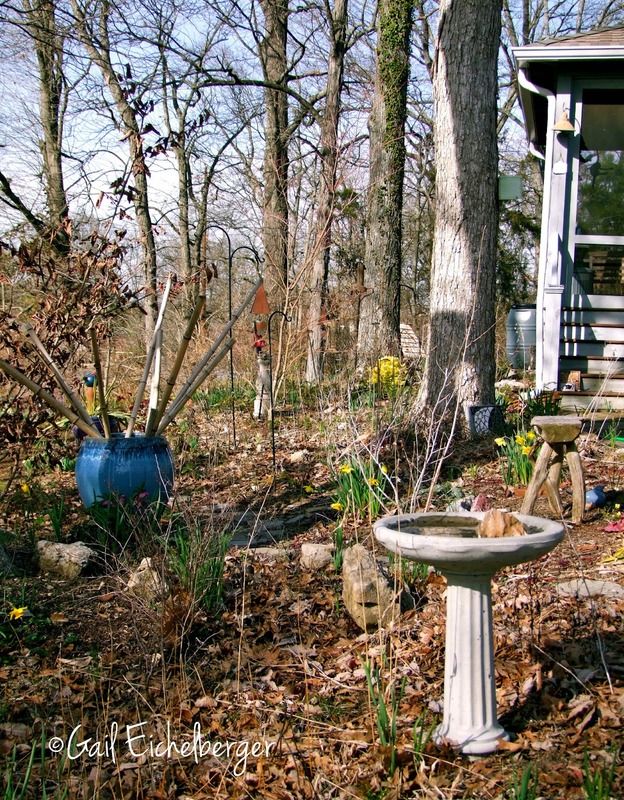 We have a long term plan for our garden, and natives will feature highly in it. Great plants to use for early pollinators...and great advice for our gardens. Your photos are outstanding (very enjoyable to walk through someone elses garden and look at all the plants in flower) and I found your tips to be quite informative. Thank you for sharing. Gail, I always learn something new here--I didn't realize that decaying leaves and grasses were also good for hibernating insects. Another reason to feel better about leaving my garden clean-up till spring! My goal this year is to sneak in some milkweed in the garden (without Mr. P's noticing it) for the Monarchs. It used to be that milkweed was rampant along roadsides and in the fields, but pesticides have all but eradicated it around here. Lovely photos! We worked in the garden yesterday and saw one wasp. There were many earthworms. Too early to know if my milkweed is coming up. Lots of great plants to remember next time I am shopping for something to add to the garden. I do want to add more Hamamelis, love the fragrances. Oh, excellent post!!! This is one of my favorite topics and you really break it down so nicely. The hardest one for me is the 3' square of bare soil... but I always feel terrible when I'm cultivating in the spring and the ground bees can't find their nests. I see them searching in vain and wish there were neon lights flashing anywhere they make a hole so I don't accidentally dig it up. Ix-nay! I love it Gail. Did you know that our dear Dee Nash gave a rave review of your blog to all the people at her talk at the Northwest Flower and Garden Show??? Good friend. I always enjoy posts like this. The only one I didn't know was the 3 feet of bare soil. Well, that is covered in my garden at the neighbor's across the street and more. 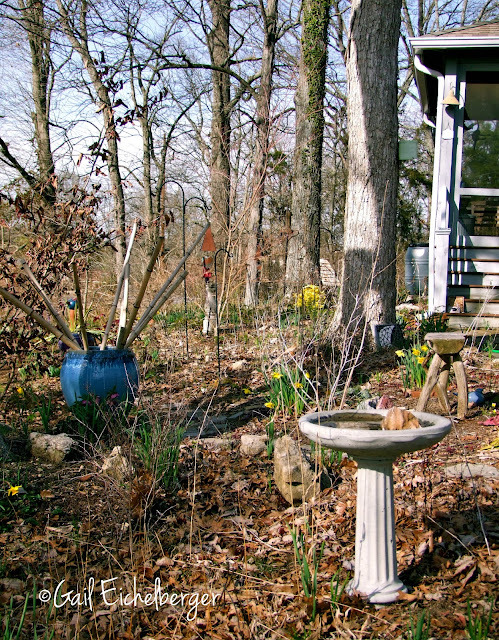 The trees shade much of the garden, and I just have trouble getting things to grow, so I don't try to plant the whole thing. I have lots of piles of stems and leaves around, too. I put the stems from the Joe Pye Weed in our yard, hoping to get a bee home made from them.